The couple donned their gloves, a footman opened the door, and they stepped outside. Water from a fleeting shower glistened in the mid-morning sunshine; nature gilded with diamonds and silver. The door eased slowly closed. “Beautiful,” Hugh breathed with a long sigh. 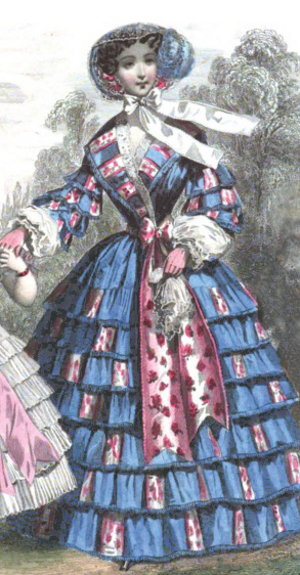 Kate’s walking dress may have looked something like this fashion print, c. 1852. Kate made a quick inspection of her shimmering light-blue taffeta walking outfit, the wide lapels, and extravagant sash, all trimmed with white and pink ribbon, and red embroidery. Fancier than she would normally wear in the country, it had been purchased for promenades on cool days in city parks, but Jane insisted the dress be worn during Hugh’s visit, and Kate grew tired of arguing about her wardrobe. She liked the way it accentuated her physique, especially with a quilted under-vest improving her bosom, and three petticoats flaring the flounced skirt. She imagined it being particularly alluring on a bright day with a light covering of snow, if such an occasion ever did present itself. On Hugh’s previous visit they had walked to the north edge of the village and called at Crowcombe Court, Hugh paying his respects to the Carew family. Today they were going to the south of the village, to visit the small cottages where the poorest of labourers resided. As they strolled through the woods and along hedgerows, Hugh spoke of his parliamentary duties and endeavours within the riding of Chester. Kate feigned interest, not understanding the details of taxes, land appropriation, and industry. She became genuinely engaged when he mentioned travelling, and voiced her enthusiasm for a voyage. Having broached this subject before, it became somewhat of a reiteration of aspirations, with the added facet of sailing together as newly-weds, an exciting and somewhat perplexing prospect for Kate. She always expected to go on some sort of grand tour with her brother upon coming out, now it would be after marriage with her husband? Not until she reached the age of seventeen and a half, or eighteen? Perhaps it could be two voyages, separated by a couple years? Allow?! Imprudent?! “Of course not,” Kate agreed woodenly, but thought otherwise. What risk? I would avoid any fighting. It wouldn’t have anything to do with me. “Ah. Right. Quite.” Bah, sounds a dreadful bore. God’s wounds – social functions! I must complete my dance instruction! They reached a stile straddling a high stone wall. Hugh stood beside the ladder to monitor Kate as she scaled six steep rungs to the wide top planks, then insisted on getting up with her, shifting awkwardly around, then he climbed down the other side. He gave Kate a hand to assist as she descended. Kate endured this tedious process twice on the way to Crowcombe. On Hugh’s last visit he was less fastidious with his attentions, and Kate thought this change must be her agreeing to their impending engagement. Easier for Kate to cope unaided, on countless occasions she had run up one side of stiles and leapt from the top, pretending to fly. They ambled along another stretch of hedgerow before taking a path into the west end of the village, finding it quiet. Passing through some sheep pastures, following a stream, Kate guiding, they were able to make a fairly direct line to a collection of bedraggled little cottages near the turnpike road. The home containing illness was evident by a swag of fennel, corn mint, and other plants, nailed to the door. Figures by Thatched Cottage 1831, by N.S.L. Fielding (1799 – 1856). 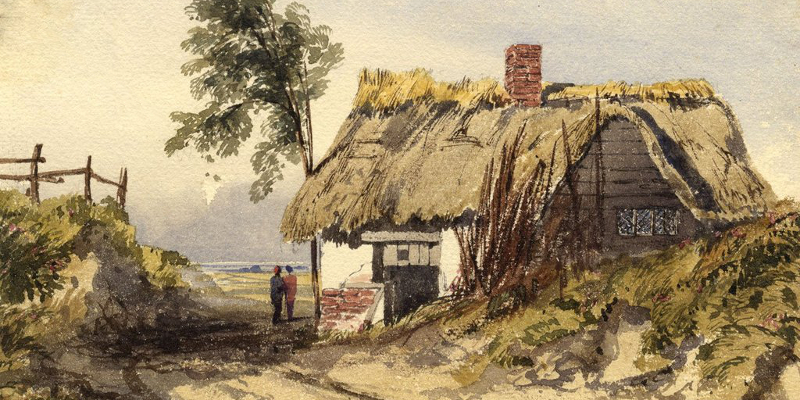 This detail of a watercolour nicely illustrates the sort of little patched together dwellings in which the vast majority of poor rural Britons resided up to the 1900s. “You’ll find me by that tree.” He indicated an enormous gnarled oak. Kate approached the cottage door and tapped tentatively with the crude wrought iron knocker. The door creaked open a crack. A scruffy girl of about six years of age squinted out, then up at Kate. “Come in.” Dorcas pulled the door wide, hinges squealing. “We observed your continued absence from church,” Kate said, stepping inside, “and have asked about your mother for over a week.” The door closed, casting Kate into a state of blindness, scant light coming from the edges of one small shuttered window. She took a few paces and bumped her head on a timber, discerning only flat shades of black and brown. Kate set the basket aside and removed her bonnet, feeling blinkered by the brim, although the stiff construction of the headdress did serve as protection from injury. I need to see! Drat, there goes a comb. A few of the seven heavy braids, that had been looped and secured at the back of Kate’s head, loosened and sagged onto a shoulder, then she felt one tumble down over her breast. “Who be there?” a weak voice called from the other room of the cottage, punctuated by wet throaty coughs. “It’s Lady Kate from Quantock Hall come a calling,” Dorcas replied. She scampered through a dark doorway, then light from within spilled out as the covers of another window were thrown open. More plants were bundled on the sill and swags nailed to the shutters. The girl edged around the bed and took the basket into the main room. Kate made some small talk and enquired after the teens of the family, all of whom had moved away and were in declining states of health. This wasn’t anything Kate wanted to hear about, but she felt it necessary to show interest, no matter how sad. Thankfully, the two youngest children showed no signs of affliction. “How is Zeke?” Kate asked about the Weetchs’ healthy eleven-year-old son. “Very kind, m’lady. Thank you.” She coughed again, covering her mouth with a blood-stained handkerchief, which she had managed thus far to keep hidden. Kate crouched and made her way to the front door. Dorcas padded after her, bare feet on the packed clay floor. The girl let Kate out with a gap-tooth grin. She put on her bonnet and found the brim somewhat askew from the earlier collision with the ceiling timber. Hugh waved from the tree and they met half way, then sauntered past more drooping cottages. Hugh’s suit may have looked something like this fashion print, c. 1853. Plaid trousers were also popular. “You untied your hair.” Hugh said. “Thank you.” Is it truly? She briefly twisted her front braids together, wishing they weren’t quite so black. “Yes, ’tis.” Kate felt sad for the family, and thought of her brother, who died at the age of five. “Mere trifles. Winter ague, that sort of thing. We’ll be a strong couple – bodes well for children.” He grinned. “A few months now.” Hugh nodded. “I think he’ll do well in the Royal Navy,” Kate said, recalling Bert’s rough and ready attitude during the days they played together as children. “I do too.” Hugh stopped and made a slow revolution. “Were these cottages erected during the Roman occupation?” he asked with a smirk. Kate laughed at his jest. “All along here.” Kate pointed. “Shall we take the turnpike to the road, and go into the village that way?” She altered her direction towards a gap in a hedgerow. “Ah…” Well, pooh! Why not?! “Oh. Interesting.” Kate hadn’t made such considerations. They walked and talked, and noted the fine upkeep of the houses within the village. As Hugh examined the architecture of the church, Kate looked across the road at a building that served as a school, meeting hall, and poor house. A party of women and children were pressing apple pulp and bottling the juice. Singing drifted out of the upper open windows. A scrawled notice pinned to one of the low arched doors announced fresh cider at a Friends Society meeting on the yard by the inn. 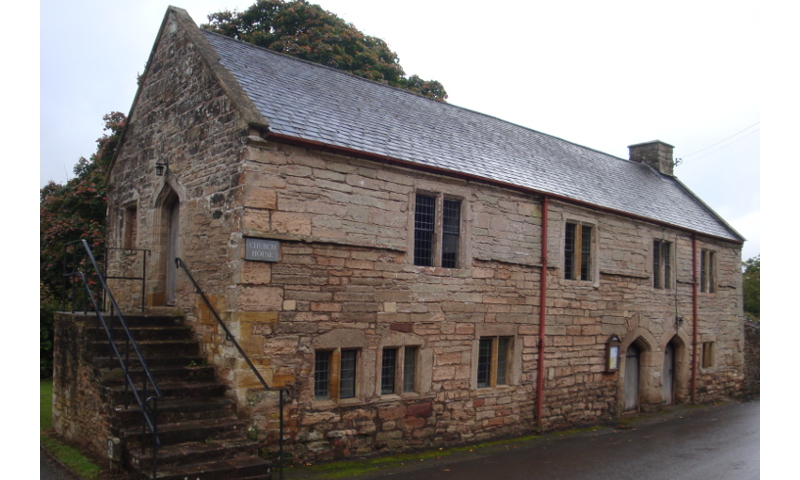 Crowcombe Church House as it is today. It is worth a visit if you are touring in the area. “Would you like some cider?” Kate asked Hugh, feeling thirsty. “No, it’s fresh.” She indicated the work party with an open hand. They strolled along the road to a spot where tables and chairs were set out on a yard, in the sunshine and under ancient elm and chestnut trees, across from the broken red sandstone medieval cross, denoting the original marketplace of the village. At a table covered by an assortment of large clay mugs, a girl served them with a little curtsey. Elderly villagers sat and sipped in the sunshine, chatting quietly. Later, when the church bells rang noon, no doubt everyone working in the area would gather with their bundles of food and share the cider and camaraderie. Rather than intrude upon the villagers’ space, Kate minced over to a small empty table and only one chair, followed by Hugh. Their clothing burst with colour and glistened compared to the faded shades of brown and grey worn by the villagers. Kate’s bonnet still askew, she took it off and placed it on the chair. “I fully concur.” I admire his strong conviction. Kate didn’t finish her queries, interrupted by loud words, a smack, and a yelp. Hugh, apparently having heard the sounds as well, raised an eyebrow and turned towards the blacksmith shop. Kate saw a rugged man with a dark glowering face, standing over a prostrate form in tattered clothes. It was a boy, about Kate’s age, who she had known since childhood as Hobbie; a poor scrawny imbecile who giggled incessantly. Kate knew the man as well; Mr. Thorne, a hardy labourer for hire from Stogumber, who owned a team of fine draught horses. Whenever there was a heavy work project in the area, Mr. Thorne would be present, toiling stolidly to get the job done and demanding decent wages. Known for being brusque and all business, he wouldn’t suffer foolishness gladly under any circumstance. Kate banged her mug on the table, spilling cider. “Mr. Thorne! What are you doing?” She dashed along the road. Horses whinnied and stamped their hoofs as she passed. Kate didn’t turn back, keeping her eyes fixed on Mr. Thorne, who stood over Hobbie with threatening fists. “Don’t touch him!” Kate yelled. “Step away!” She saw Mr. Thorne glance up at her, then down at Hobbie again. “Step away!” Mr. Thorne moved a few paces back as Kate arrived at the assault and crouched beside the boy. Mr. Nettles, the farrier, came out of the smithy carrying various tools. “What’s all this?” he asked. Hobbie sat up, weeping, rubbing his eyes with filthy hands, a large welt on his left cheekbone. “There now, Hobbie, you’re all right.” Kate placed an arm around his shoulders. “Why did you strike him so?” she demanded, glaring at Mr. Thorne. “He were laughing at me,” Mr. Thorne said, words accented with anger. “Let me help the lad,” Hugh said. Kate realised Hugh was standing behind her, holding her bonnet. Together they got Hobbie on his feet. He stood only as high as Kate’s shoulder. “He don’t learn!” Mr. Thorne barked with gnashing teeth and fists raised. Mr. Thorne froze. Mr. Nettles eyes bulged. Hobbie hiccuped. “I… er… what?” Mr. Thorne held a fighting stance, but swivelled his torso toward Kate, and opened his hands. “And you’ll never work for my father again,” Kate added, rather weakly after such a theatrical declaration. “Nah, o’ course not.” Mr. Thorne retreated, wrathful lines on his face melting to a scowl, and stood beside the farrier, who still stared agape at Kate. Hoof cutters c. 1850. These heavy tools range from 12 to 24 inches (30 to 60 com) in length and could serve as a nasty weapon. Kate, relaxing her grip and lowering the tool, saw about a score of villagers gawking at the high drama playing out in front of the smithy. “Ahem, ah, thank you, Mr. Nettles.” Kate held the cutters like a valuable sceptre and carefully presented them to the farrier. “Come with me, Hobbie.” She took his hand and led him along the road, Hugh by her side. Kate kept her head high but lids down, not wanting to make eye contact with anyone. While doing her utmost to appear poised, jangled nerves and pounding heart reverberated through her body. “You’ll be all right, now?” she asked Hobbie, stopping at the medieval cross. “Thank’ee! Hee hee, hee hee.” He knuckled his brow and skipped away giggling. “Yes. That’s it.” Paragon of domestic tranquillity?! That’s unlikely! “Goodness, no!” Kate lied prettily, wide-eyed with some well-timed blinks. I’d have beat him senseless! “It hasn’t happened before,” Kate lied again. Damn my temper! It will see me undone one day. 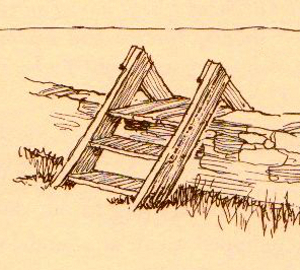 A low stile, drawn by Noah Blake in 1805. Stiles over high walls might have seven or eight steps up and down. They reached a stile and went through the process of climbing over the wall. On the other side, as Hugh helped Kate hop down from the last step, the couple stood close, face-to-face. “I must say,” Hugh said softly, hesitating with his words, “you should have seen your expression! When you were angry – the fire! My word… what, determination!” He glanced down and momentarily touched the ring he had given her, then met her gaze again. “Terrible and frightful, but splendid, with flashing eyes, like Athena, or the ravishingly beautiful Medusa. With your hair all plaited – they could have become serpents!” He laughed. Hugh’s touch of the ring reminded Kate of a conversation with her step-mother from the previous evening, as they appraised the ring before retiring to bed. Doubts lingered in the back of Kate’s mind about the entire arrangement. “Hugh, about this ring.” Kate plucked at it from the chain around her neck. “Didn’t your mother want to give you something, to give to me? Something from her…” This is it. Now I’ll learn how his parents feel. Hugh didn’t answer. He rubbed an ear, and seemed to scan the forest. “Your parents don’t know about our agreement.” Kate said, her stomach burning. Jane is right, he hasn’t obtained permission from his father. Kate saw tears in his eyes. They embraced, and kissed, cautiously, then passionately; salty lips, then tongues coming together fervently. Kate felt light-headed, and couldn’t breathe, letting herself wilt in his arms. Hugh held her firmly, one arm girding her waist while the other cradled her shoulders. How long it went on she could never recall, but it remained a cherished memory forever. She slowly opened her eyes and focused on Hugh’s flushed face. I’m tingling all over! What is this? Kate straightened and bounced out of Hugh’s arms, muscles taut, the word hitting hard and causing her stomach to burn anew and tighten painfully. Lust? That ought not happen! It mustn’t! Not until we wed! Only the most innocent of love-making – little kisses and hugs. She edged away, then turned, slipped a handkerchief from a hidden skirt pocket and dabbed her nose and eyes. Shivers ran from her scalp to her thighs. She felt hot and cold and trembled. Take a deep breath. Calm down. Hugh retrieved Kate’s bonnet from the ground; she didn’t remember it falling off. They laughed. Kate found herself liking Hugh more and more.